Steps stones are a great way to liven up a yard or garden. Using stones to create a path through your garden can save the lawn from wear and tear and save shoes on wet days. But they can also be a great way to add a whimsical touch or simple elegance to a lawn. 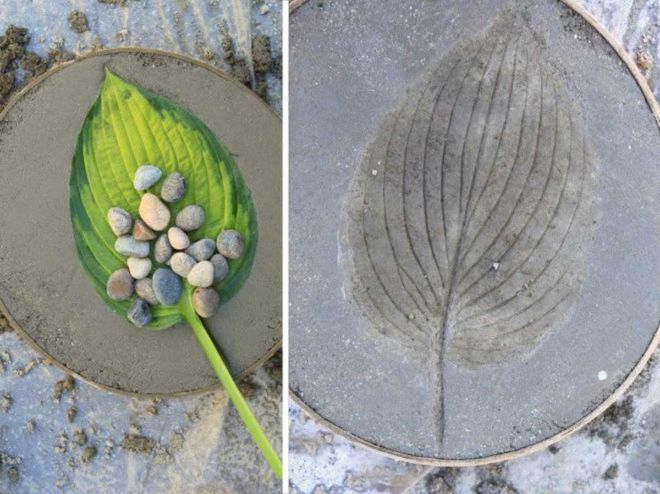 Here we have gathered some incredible ideas for making your own cement step stones using simple techniques and leaves from your garden. 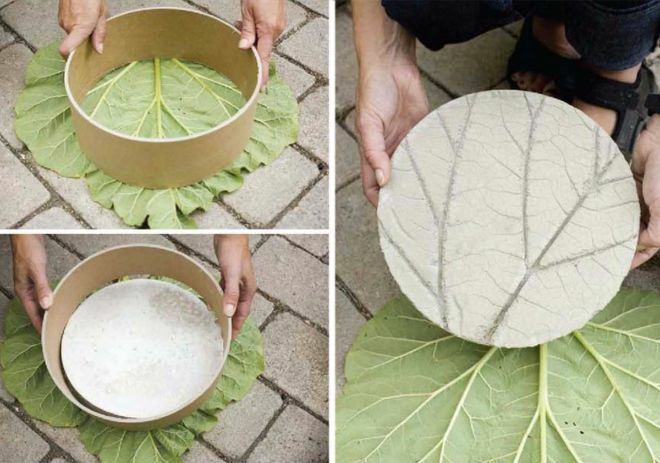 For each of these techniques, you will need oil to keep the leaves from sticking (cooking oil, vaseline or WD-40), cement mix, and your imagination. This first elegant step stone is a great way to give natural texture to a simple round step stone. The original design was shared by Charlotte on her blog, Home Realm, then translated into English by Jane Wrigglesworth on Flaming Petal. Be sure to use the underside of the leaf to imprint the design on the cement for the most visibility. 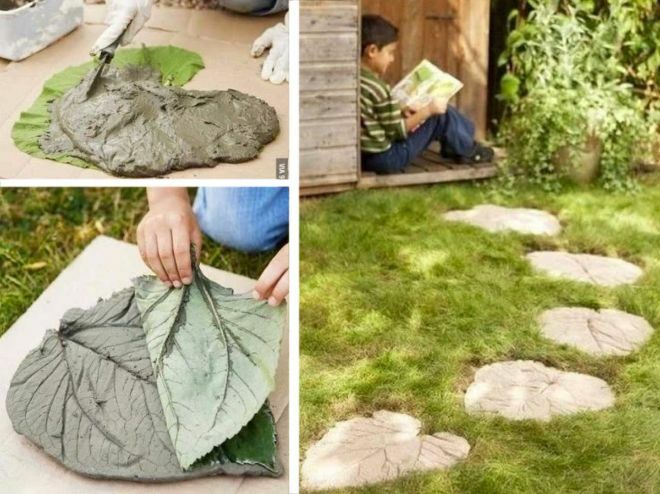 If you would prefer something a little more whimsical, try these whole leaf step stones. Kids will love hopping from leaf to leaf, and the organic shape lends itself perfectly to gardens with more natural than manicured looks. Dream Garden 101 recommends placing wire mesh (cut just smaller than the leaf) between two layers of cement. This will help hold the shape. 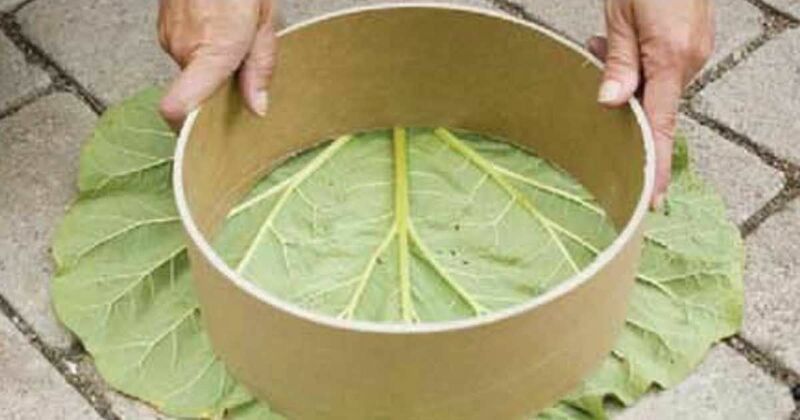 If you aren't sure where to get large leaves or if your favorite plant has smaller leaves, try this technique by Garden Therapy as shared on ebay. Each stone cost about $2 in materials and has an impeccable professionally finished look. Stephanie purchased and cut a concrete form into 2" pieces to make multiple steps at once. If, however, you only need 2 or 3 stones, consider using a smooth cake pan (don't forget to liberally oil the pan!). For a deeper impression, simply push the leaf into the cement deeper and use more stones to hold the leaves in place. 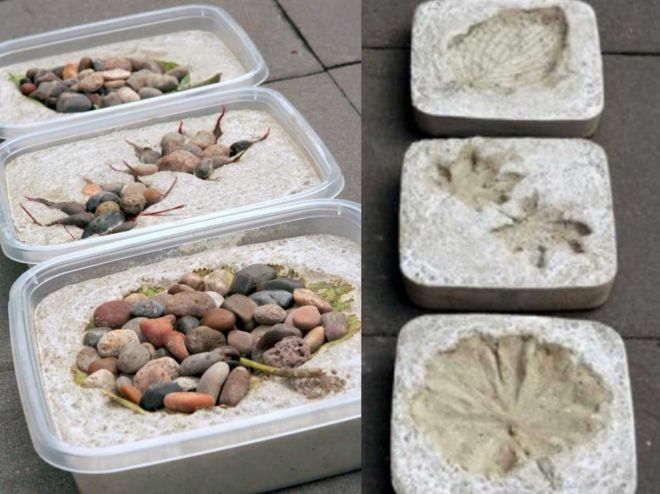 Stephanie of Garden Therapy used plastic containers to make these square stones. She did note that the sharp edges of the Japanese maple leaves didn't transfer as well to the cement. Although we love the look of imprinted leaves, try using letters or other shapes to make personalized step stones that can last for years. Final tip: Cement or Hypertufa? All of the above DIY projects were done with cement, but you may have been hearing a lot about hypertufa, a mixture of cement with peat moss and perlite. Because it is relatively easy to work with (it's moldable) and lightweight, it is a great material for DIY gardeners. Flea Market Gardening writes that sturdiness is more important in step stones than being lightweight, and recommends Quick-crete. Sue does note, however, that "(she) did use hypertufa for (her) stepping stone and it’s lasted three years wonderfully." Are you feeling inspired? Don't forget to SHARE with your friends! Now, THIS is a showstopper of a DIY. This is the kind of DIY that your houseguests will assume you spent a lot of money on in the store. A guy takes his garden to beautiful new heights with this neat DIY. Give your storage bins a much needed makeover so they can organize your house more efficiently and beautifully. Or, transform them into something completely new. We've got all the inspiration you need to get started crafting! Looking for a way to add a bit of glam to your home? This is the perfect DIY.